Solidarity means to stand (work, invest, harvest and nourish) with all the people of the earth willing to work together to provide essential goods and services for each person. We can help all those who will contribute effort and resources towards common well-being. In solidarity with people here and in an interdependent world, we conserve resources so that systems may be established to recognise and employ the gifts of everyone and the environment in investment and exchange. In integrity (equally respecting all components and systems at every scale from micro to macro), we include every person as a positive resource and contributor to their livelihood requirements. In this sense we live and work simply, conserving our resources till worldwide, everyone, every being and the environment is empowered to create and have at least enough resources to continue and thrive. a)Socrates: "He is rich who is content with the least; for contentment is the wealth of nature." "What a lot of things there are a man can do without." "The way to gain a good reputation is to endeavor to be what you desire to appear." "How many are the things I can do without!" "Remember, no human condition is ever permanent. Then you will not be overjoyed in good fortune nor too scornful in misfortune." In the ‘indigenous’ (Latin = ‘self-generating’) welcome tradition of the Longhouse and String-shell, I openly structure my economy in a full-cycle of formal giving and receiving, so that all may partake equitably. I water-cleanse, avoiding paper tissue since 2005. * Acting towards the fulfillment of essential purposes is a human right and obligation. We may use the means and any steps necessary to achieve essential needs. Example: The planting of trees may not realize produce for a few years, and the tools necessary be they mechanical, electronic etc. may not fall within the scope of essential resources in themselves but are engaged towards essential aims, as our individual and collective choices allow us. Hence the capital building of ecological infrastructure, tools, water systems, housing, transportation, storage, transformation facilities, biosphere tools, bio-diversity etc may all be used towards the purposes of essential goods and services. Douglas Frederick Jack, Ou Ee Ii Jay Ii (My name told to me in a dream circa 1972 at Ootischenia (Castlegar). SECURING THE MEANS OF LIVELIHOOD is a most fundamental human concern and right. When means are insecure then human existence is as well. When we have resources such as money, time or other assets, they are the result of many people having worked together in harmony with nature. EATING & LIVING SIMPLY for greatest personal or family health as well as planning for collaboration with the livelihood needs/efforts of others in community is necessary in order to generate the most effective ecological footprint. Developing critical masses of actors working together in ‘community’ service is personally and collectively empowering. The Latin origin of the words: community, communication, municipality is ‘com’ = ‘together’ + ‘munus’ = ‘gift or service’. STEWARDSHIP lies within each one of us individually and all have gifts to offer. It is my privilege to use my resources as investment to mobilise my household, family, friends and all who are receptive in community, to organise the means of production or invest capital towards creating feasible livelihood. WELCOME is humanity’s greatest gift, which we accomplish through open inclusive organisation of labour. Everything we want for the world is linked to the essence of gifts within ourselves, our families, communities, cities, provinces, nations, continents, hemispheres and world manifested at many levels. The multi-level ORCHARD-GARDEN is the earth’s most productive living resource, cultivated for the collection of solar energy, storage of water, multiple species generation and abundance of resources. Compassionate towards yourself, you reconcile all beings in the world. “Wei Wu Wei”, Chinese saying meaning “Doing, not-doing”. Does our method align with our purpose? Dr. Helen Caldicott, 2 Jan. 2003 at Smith College in Massachusetts. & share together. Personal financial management programs are available from Your Money or Your Life, by Joe Dominguez & Vicki Robin. http://yourmoneyoryourlife.info/ provides a personal Road Map for each person to implement their personal values financially. The chart on the left describes an audio program with worksheets by which individuals 1. Chart earnings and spending, 2. Calculte real hourly wage, 3. Tabulate a monthly income statement, 4. Discern life priorities, 5. Keep track day to day on a wall chart, 6. Personally discern meaningful expenditures from others, 7. Maximize satisfying income, 8. Plan for meaningful capital investment, 9. Manage investment. The Voluntary Simplicity www.simpleliving.net movement with Duane Elgin has many materials. e) TWO ROW WAMPUM Treaty as part of the Covenant Chain between First Nations and the original Dutch, English and French colonies showed the ongoing intention by First Nations since a century a welcoming Europeans. The Iroquois Confederacy, also known as the Haudenosaunee, began the Covenant Chain in 1692. This treaty is recorded in the Two Row Wampum belt called the Guswenta. First Nations fed, clothed, healed and nurtured European colonists intimately. They saw our divisions and individual isolation from each other as a feudal militaristic society. First Nations seeing our diseased social relations and having military advantage could have wiped Europeans out any time during the first two hundred years, but instead chose to help us understand their Great Law of Peace. While some whites joined with democratic First Nations to escape these cruel societies, most remained chained and subservient even to this day. The epidemics of Euro-Asian-African diseases killed some 95% of First Nation populations, policies of genocide and apartheid broke the ability of whole communities to demonstrate their methods to the newcomers. The Two Row Wampum represents a belief in the integrity of each person and the inevitability that truth will find its way as well as the Caucusing process by which those with unique differences, truths and mannerisms are invited to walk parallel paths with the main body in order so that each can further learn from each other. During the invasions, Europeans not having this civility did not understand their obligations as well as understood but feared their own societies more and therefore did not act responsibly. Two Row is included here in this section on Solidarity because it evokes the importance of individual compassionate responsibility for all those in our community and a role for individual voluntary simplicity in nurturing enough for all. The practices of the Financial Integrity program share this same respect for individual understandings and action. f) INSTITUTE for ECONOMIC DEMOCRACY JW Smith and associates have published well researched books on what has become western Plunder of Third World resources available at http://www.ied.info They provide many books free online as well as selling published paper copies. Here are two major works for those wanting to understand the world's economic system. The ecological footprint is a measure of human demand on the Earth's ecosystems. It compares human demand with planet Earth's ecological capacity to regenerate. It represents the amount of biologically productive land and sea area needed to regenerate the resources a human population consumes and to absorb and render harmless the corresponding waste. Using this assessment, it is possible to estimate how much of the Earth (or how many planet Earths) it would take to support humanity if everybody lived a given lifestyle. For 2006, humanity's total ecological footprint was estimated at 1.4 planet Earths – in other words, humanity uses ecological services 1.4 times as fast as Earth can renew them. Every year, this number is recalculated — with a three year lag due to the time it takes for the UN to collect and publish all the underlying statistics. While the term ecological footprint is widely used, methods of measurement vary. However, calculation standards are now emerging to make results more comparable and consistent. The first academic publication about the ecological footprint was by William Rees in 1992. The ecological footprint concept and calculation method was developed as the PhD dissertation of Mathis Wackernagel, under Rees' supervision at the University of British Columbia in Vancouver, Canada, from 1990–1994. Originally, Wackernagel and Rees called the concept "appropriated carrying capacity". To make the idea more accessible, Rees came up with the term "ecological footprint," inspired by a computer technician who praised his new computer's "small footprint on the desk." In early 1996, Wackernagel and Rees published the book Our Ecological Footprint: Reducing Human Impact on the Earth. A number of NGO websites allow estimation of one's ecological footprint (see Footprint Calculator, below). Ecological footprinting is now widely used around the globe as an indicator of environmental sustainability. It can be used to measure and manage the use of resources throughout the economy. It can be used to explore the sustainability of individual lifestyles, goods and services, organizations, industry sectors, neighborhoods, cities, regions and nations. Since 2006, a first set of ecological footprint standards exist that detail both communication and calculation procedures. They are available at www.footprintstandards.org and were developed in a public process facilitated by Global Footprint Network and its partner organizations. The number of hectares of productive land or sea required to support one average person at the world average consumption level. 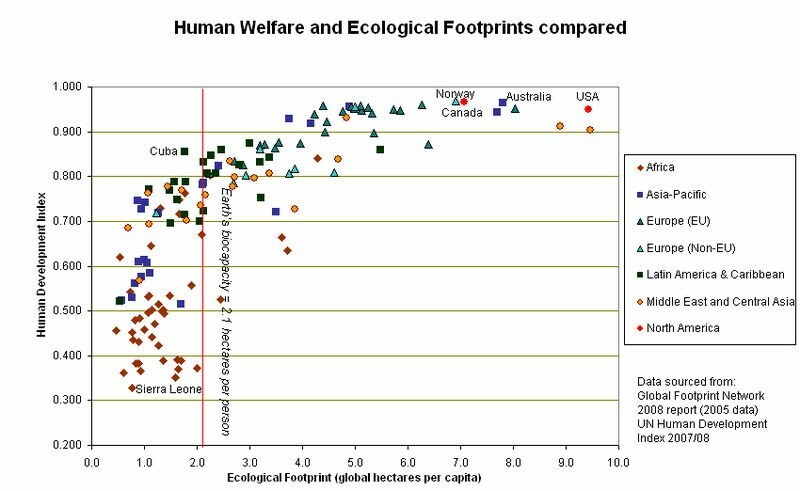 An ecological footprint is the total area of productive land and water required to support an organism and can be expressed as the number of planets that would be required to support the global population if everyone lived a certain lifestyle: in the UK this figure is three planets.